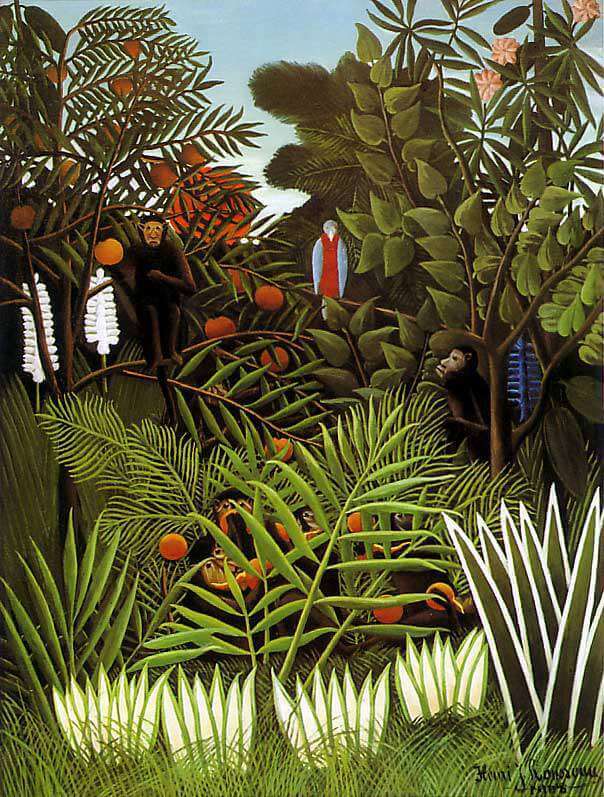 Exotic Landscape oil painting was created by Henri Rousseau in 1908. Itâs a primitivism style wildlife painting that is currently part of a private collection. Rousseau enjoyed painting jungle scenes the most, as they were his most common pieces. Exotic Landscape does feature a jungle scene, but it is not the same as his other jungle paintings. Exotic Landscape has rich shades of green used in the leaves, grass and trees of the jungle. There are oranges hanging from the trees that monkeys are picking up in the trees and on the ground. There is also a red and white bird perched up on a branch, which is in the center of the painting where the eye first looks. The sky above the jungle is a light blue with no clouds seen. The white lining on the leaves and on some of the grass make the green stand out and show a lot of detail.